multiple – If attribute is set, multiple open drawers will be enabled. By default, expanding a drawer collapses other expanded drawers. width – Width of the drawer. The default width is "100%". height – Height of the drawer. The default height is "auto". icon – URL to an optional drawer icon. label – Drawer label text. height – Optional height of the drawer. 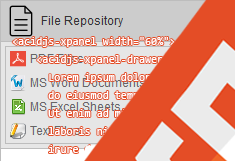 If the content exceeds the height specified, scrollbars will appear. hint – Optional hint text for the drawer header. open – By default all drawers are closed. Setting the open attribute will render that drawer open by default. Check the code of the demo page or the distribution to see how to use X-Panel and have a great weekend!